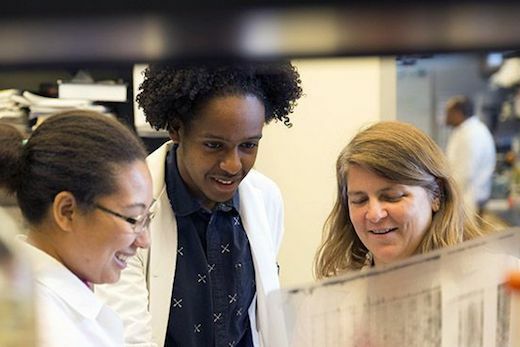 Without support and advice from a mentor, many promising scientists would give up or drop out long before earning a degree or landing their first job. Mentors fill those gaps and provide a lot of quiet, patient guidance. For a change, one of them will be getting some trumpets this week. The journal Nature is honoring Emory University biologist Anita Corbett, PhD, with one of its awards for Mentoring in Science. The awards rotate to a different country or region each year; 2018’s awards focus on the Southern United States. Corbett was a tenured professor in the School of Medicine's Department of Biochemistry before moving to the College's Department of Biology. Her lab studies RNA processing and RNA binding proteins, and their work has extended into intellectual disability – in collaboration with Ken Moberg, PhD-- and a form of muscular dystrophy, with Grace Pavlath, PhD. Corbett has trained 20 graduate students (sometimes known as the “Corbettes”), with eight more currently in training. Corbett was nominated by one of her colleagues, biochemist Christine Dunham, PhD. Her application included independent testimonials from five of her mentees, and the award was chosen by a panel of regional scientists and a Nature editor. In her application materials for the award, Corbett cites aspects of her personality that have made her a successful mentor: ability to listen, compassion, willingness to make sacrifices for others, and boldness. “Anita is unafraid to take risks and invests her whole self into making sure that her advisee has the best training as a scientist,” says ChangHui Pak, PhD, a former graduate student of Corbett’s, who worked with her on the intellectual disability project. Pak is now an assistant professor at University of Massachusetts-Amherst, studying cell adhesion in the nervous system. Corbett also cites instances of when she has encouraged or cajoled both students and peers into taking on new challenges. “Fortunately for me, I find that I am more energized and fulfilled by the successes of my mentees, formal or not, than I am by my own successes,” she writes. Corbett is currently director of Emory’s Initiative to Maximize Student Development (IMSD), which seeks to nurture young scientists and increase the diversity of the scientific workforce. She is also program director for the Genetics and Molecular Biology graduate program, the co-director of Emory’s MD/PhD program and has been at the center of a multi-year push to train Emory biomedical graduate students to successfully apply for their own grants from the National Institutes of Health, a critical part of research life. Corbett’s award fits together with a renewed emphasis on mentoring at the Laney Graduate School and the Graduate Division of Biological and Biomedical Sciences (GDBBS). Graduate school can be a stressful time of life, with many students encountering mental health challenges. Realizing that mentoring is often something neglected in the competitive crush of academia, several faculty, including Corbett, formed the Atlanta Society of Mentors. And starting in 2017, all new GDBBS faculty without a prior training history have been required to participate in mentoring workshops. According to Nature, Corbett is one of two mid-career awardees, and will split a prize of $10,000 with Kjersti Aagaard, MD, PhD, a geneticist and specialist in maternal-fetal medicine at Baylor College of Medicine. Honoring one of her own mentors, Corbett is donating the prize money to the GDBBS to support the Keith Wilkinson Division Service Award.